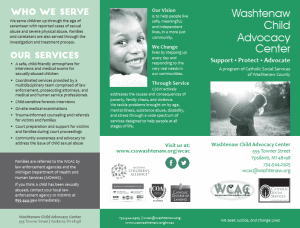 The CSSW Washtenaw Child Advocacy Center (WCAC) is a child-focused program in which the Michigan Department of Health and Human Services, Washtenaw County Prosecutor’s office, local law enforcement agencies, mental health and medical professionals, and victims’ advocates work together to conduct forensic interviews and make team decisions about the investigation, treatment, and prosecution of child sexual abuse cases. WCAC helps minimize the trauma to children and families by offering crisis intervention services, coordinated case management, and emotional support as cases go through the legal system. Since 1985, police, prosecutors, and the Department of Health and Human Services in Washtenaw County have worked collaboratively through a written protocol to investigate child abuse cases. In Spring 2002, these stakeholders met to discuss bringing a Child Advocacy Center to the county to better meet the needs of sexually abused children and their families. In January 2003, and again in January 2005, stakeholders signed a Purpose Statement and Multi-Agency Agreement committing their effort, participation, and support of the WCAC and its implementation. We’re grateful for Washtenaw County’s commitment to protecting children. Visit us on the Washtenaw County Government website. Only children referred by the Michigan Department of Health and Human Services or law enforcement are eligible to receive forensic interviews and medical exams at the WCAC. Anyone (with or without a referral) seeking counseling or prevention education can call 734.544.2925.